What if our last act could be a gift to the planet? Determined that his final resting place will benefit the earth, musician, psychiatrist, and folk dancer Clark Wang prepares for his own green burial while battling lymphoma. The spirited Clark boldly faces his own mortality, embracing the planning of a spiritually meaningful funeral and join with a compassionate local cemetarian to use green burial to save a North Carolina woods from being clear-cut. 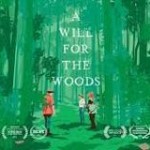 With poignancy and unexpected humor, A Will for the Woods portrays the last days of a multifaceted advocate – and one community’s role in the genesis of a revolutionary movement. As the film follows Clark’s dream of leaving a legacy in harmony with timeless cycles, environmentalism takes on a profound intimacy. Coming Up: Save the Date for the final film: Catching the Sun, Saturday, June 11, 2016 at 7:00pm.